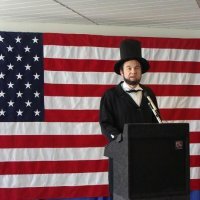 Abraham Lincoln would love to come speak at your school! If you have found this website, you are looking to hire Abraham Lincoln! John Cooper is your man. John has a deep love for history. He enjoys reading about President Lincoln, and he remembers everything he reads. John is a great speaker who always keeps his audience entertained. You will not regret having him around! John Cooper as Abraham Lincoln (in Ohio and surrounding states). Residence near Pickerington, OH, outside Columbus, OH. Appearances for festivals, schools, banquets, encampments; anything where you might like to meet President Lincoln. Reasonable fees, negotiable based on time, type of engagement, and travel distance. When you email or call, ask for a promotional DVD!